Brund Fell is the main summit in the area of undulating high ground between Watendlath and the jaws of Borrowdale, topped by a splendid rocky summit. Some of the wider area is called Grange Fell (presumably this is limited to the area actually facing Grange village). The views from Brund Fell are a little limited by the large area of high ground to the north, but the views west and south are great and the Helvellyn range lines the eastern skyline. Brund Fell is at the southern end of a roughly triangular wedge of high ground that starts at Lodore, where the River Derwent and Watendlath Beck flow into Derwent Water with a few hundred meters of each other. A finger of high ground runs south from Lodore over Brown Dodd and Ether Knott up to Grange Fell and at the top Brund Fell. The eastern and western slopes of this wedge are steep sided, with a limited number of routes onto the top. To the south the ground drops away more gently to Puddingstone Bank, and the foot pass between Borrowdale and Watendlath. This is a lovely area, especially on the wide undulating upper reaches, with lots of mini-summits to explore (although the heather can make wandering a little difficult). The top of this wedge is pleasingly undulating, with a series of rocky tors breaking out of the heather (with the odd wetter patch - in particular Long Moss, Bleacrag Moss and some of the slopes just above Watendlath. The only other generally recognised summit in this patch of high ground is King's How, to the north-west of Brund Fell on the far side of Long Moss. The fell was purchased for the National Trust by Princess Louise, in 1910 and renamed King's How in memory of her brother Edward VII. Ether Knott, further north along the ridge, is rarely visited and is more of an outcrop on a ridge than a separate fell in its own right. There is only one path to the summit of Brund Fell. From the east this starts at Watendlath hamlet and heads almost due west towards the summit. The path then runs west from Brund Fell for about 800ft then reaches a north-south path that runs from Long Moss in the north to the pass from Watendlath to Borrowdale in the south. The northern end of this ridge can be approached from King's How (head north from the summit then south-east down a gap in the line of crags), or up the steep path through the woods from Brock Bield. We have a walk that visits King's How, but not yet Brund Fell. The summit of Brund Fell is a rocky tor that rises out of a sea of heather, with several competing patches of rock spread out across the highest part of the fell, and with a nice footpath running from west-to-east across the top. The highest point is obvious. The southern boundary of the fell is formed by Frith Gill, which flows west from Puddingstone Bank then turns north to run into the River Derwent close to Red Brow, and by Bowdergate Gill, flowing east into Watendlath Tarn. The eastern boundary is formed by Watendlath Beck. The northern boundary, along the finger of high ground heading towards Lodore, is rather ill-defined - if we take Ether Knott as a boundary then the northern boundary is formed by a nameless beck to the east and Comb Gill coming out of Bleacrag Moss to the west - if we take the entire ridge as one entity then the northern boundary is Derwent Water. To the west a nameless beck flows south into Frith Gill, while one of the tributaries of Comb Gill flows north alongside a steep footpath that drops down through the woods on the north-western corner of the high ground. 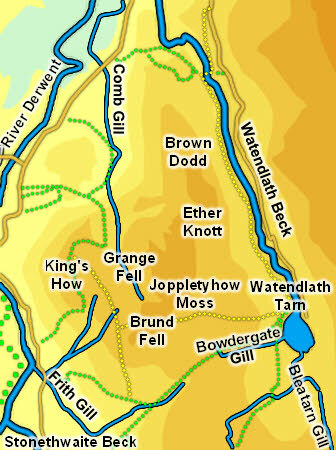 If King's How is included then the Derwent forms the western boundary. There are a number of small nameless becks that flow off this high ground heading east and west into the surrounding valleys. Brund Fell has a small footing on the delightful Watendlath Tarn, between Bowdergate Gill and Watendlath Beck. At the very northern tip of this wedge of high ground is Lodore Falls, one of the more impressive waterfalls in the area, where Watendlath Beck drops down from the hanging valley of Watendlath into the lower valley of Borrowdale. The falls can be reached along a path that passes the Lodore Hotel. The Bowder Stone will be covered under King's How.